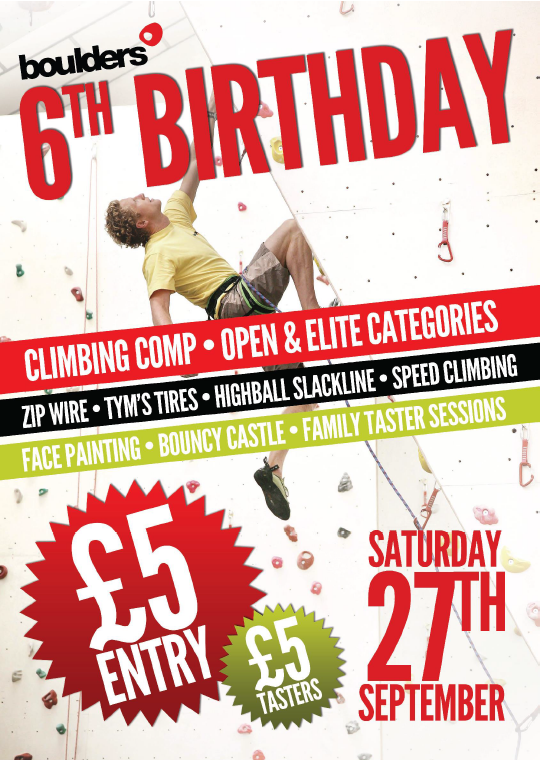 Boulders is pleased to announce its 6th Birthday will be taking place on Saturday, 27th September, starting at 10AM. Since the centre launched in September of 2008, Boulders has gone on to inspire, educate, give back and push the art and sport of climbing forward significantly in Wales, with ambitions higher than ever to open multi-national sites in the UK. Host to a range of fun and diverse climbing activities in South Wales for anyone aged 7 and above, Boulders provides activities for individuals, school groups, youth groups and charities. Whether you are a climbing novice or a competent climber with a wealth of experience, the centre can accommodate all; sessions also provide for individuals who suffer with a condition or disability who wish to be hoisted up our walls in a controlled and safe environment. It is with this approach in mind that Boulders encourages aspiring climbers to, quite simply, ‘climb more’. This message applies to everyone. Boulder’s birthday is the perfect way to celebrate the centre’s 6th year in Wales. Host to an all-day event of fun and activities, the event will offer £5 family taster sessions, an open competition to beginners, intermediate and elite climbers, new activities with ‘Tym’s Tyres’ and highball slack lining, but also face painting, and not forgetting, the bouncy castle. However, Saturday 27th September is not just an occasion to celebrate, but also to give back to the community. Over the last few years, Boulders has given back to the charity and community sector within the surrounding regions of South Wales. This has included schools, clubs, events, worthy causes involving the sport, and community groups. To coincide with Boulders Birthday Bash celebrations the centre will exclusively announce their new ‘charity of the year’: the Central Beacons Mountain Rescue Team. As a voluntary search and rescue service covering regions in South and Mid Wales, including Pen-y-Fan, Boulders will donate all proceeds from the £5 climbing taster sessions to the association, and, last year’s ‘charity of the year’, ‘Climbers Against Cancer’. Each year, Boulders uses its platform as a climbing stage and venue to raise funds for worthy causes – all in the name of fun and of course, climbing. Fundraising for the centre’s local partner, Tenovus Cancer charity, the team at Boulders took part in a ‘knockout challenge’ in 2011 which was a great success. Conquering inflatable obstacles and barriers, Boulders were able to raise hundreds of pounds towards care, support and further research on behalf of Tenovus Cancer charity. Charitable work has continued right through to 2014, with contributory donations from Ollie, Managing Director at Boulders. As a strong supporter of local engagement with the community, Boulders adopts the firm belief that providing activities to those less fortunate will not only give them a chance to climb, but bring people together through the sport, and, lift their spirits for the better.